The weathervane store at SS Nautical has copper weathervanes and a variety of weather vanes made of recycled, rust-free, cast aluminum, and finished with durable, weather-resistant finishes. 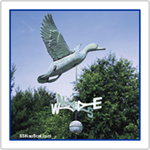 Search our site for the type of weathervane ornament you are looking for! 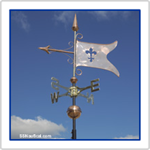 SSNautical.com is proud to be your online source for Whitehall Products, the world's largest manufaturer of weathervanes, offering over 100 different styles. Many styles include a variety of color choices such as traditional black, aged verdigris or rust, polished copper ornaments, gold bronze ornaments, and even hand painted ornaments. 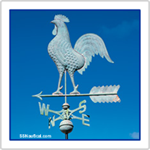 Whitehall's more than 60 years of weathervane makine experience assures you will receive a carefully crafted and meticulously detailed weather instrument which will provide a lifetime of enjoyment. Large full-bodied copper weathervane ornament. Hand hammered styling. 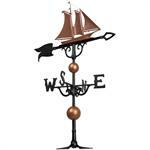 This sailboat weathervane is hand-crafted of copper and brass. Includes adjustable aluminum weathervane roof mount base. Large full-bodied copper weathervane ornament. Hand hammered styling. This Heron weathervane is hand-crafted of copper and brass. Includes adjustable aluminum weathervane roof mount base. Large full-bodied copper weathervane ornament. Hand hammered styling. This Duck weathervane is hand-crafted of copper and brass. Includes adjustable aluminum weathervane roof mount base. Large full-bodied copper weathervane ornament. Hand hammered styling. This Eagle weathervane is hand-crafted of copper and brass. Includes adjustable aluminum weathervane roof mount base. Large full-bodied copper weathervane ornament. Hand hammered styling. This banner weathervane is hand-crafted of copper and brass. Includes adjustable aluminum weathervane roof mount base. Large full-bodied copper weathervane ornament. Hand hammered styling. 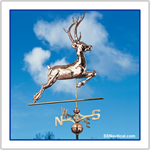 This deer weathervane is hand-crafted of copper and brass. Includes adjustable aluminum weathervane roof mount base. Large full-bodied copper weathervane ornament. Hand hammered styling. This rooster weathervane is hand-crafted of copper and brass. Includes adjustable aluminum weathervane roof mount base. Large full-bodied copper weathervane ornament. Hand hammered styling. This horse weathervane is hand-crafted of copper and brass. Includes adjustable aluminum weathervane roof mount base. 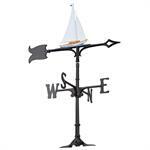 This 30" Sailboat Weathervane for the nautical enthusiast. Adds the perfect finishing touch for any home, shed, garage or deck. Features a handmade aluminum casting that showcases an intricate and detailed nautical design. This 30" Lighthouse Weathervane adds to the decor of your coastal home or cottage. Weathervane for the nautical enthusiast. Features a handmade aluminum casting that showcases an intricate and detailed nautical design. This 30" Schooner Weathervane for the nautical enthusiast. 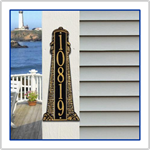 Adds the perfect finishing touch for any home, shed, garage or deck. Features a handmade aluminum casting that showcases an intricate and detailed nautical design. 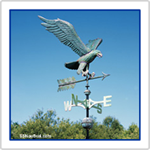 The classic 30" Clipper Weathervane is the perfect finishing touch to your home, shed, garage or deck. This weathervane features a handmade aluminum casting that showcases an intricate and detailed nautical design. Black finish. 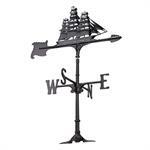 The classic Sailboat Weathervane is the perfect finishing touch to your home, shed, garage or deck. 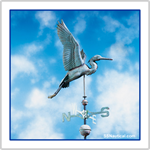 This 24" weathervane features a handmade aluminum casting that showcases an intricate and detailed nautical design. Black finish. 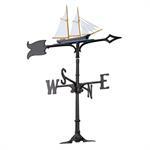 The classic Sailboat Weathervane is the perfect finishing touch to your home, shed, garage or deck. 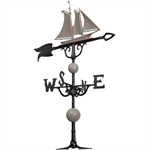 This 30" weathervane features a handmade aluminum casting that showcases an intricate and detailed nautical design. Black finish. 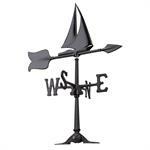 The 46" classic Yacht Weathervane is the perfect finishing touch to your home, shed, garage or deck. 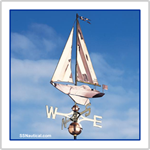 This 46" weathervane features a handmade aluminum casting that showcases an intricate and detailed nautical design. Black finish. 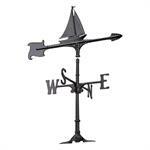 Style up your home, shed, garage or deck with this decorative weathervane. The 46" classic Copper Yacht Weathervane adds the perfect finishing touch. Features a handmade aluminum casting that showcases an intricate and detailed nautical design. 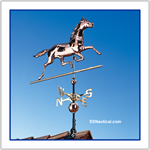 Style up your home, shed, garage or deck with this decorative weathervane. 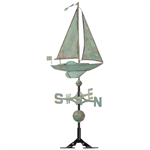 The 46" classic Verdigris Yacht Weathervane adds the perfect finishing touch. Features a handmade aluminum casting that showcases an intricate and detailed nautical design.